Patients are asked to allow an hour for their first visit. There will be forms that need to be filled out to help the doctor understand what is the problem. These forms are available on this website and may be filled out prior to arriving at the office. 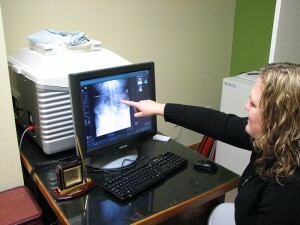 Dr. Carissa Hoops will go over your paperwork with you to determine if chiropractic care is warranted. If it is, she will preform a complete health history and physical exam. If deemed necessary, x-rays will be taken at this time. Dr. Hoops will give treatment on the first visit. Upon completion of your first visit, you will schedule a follow-up visit for the next day. During this appointment, Dr. Hoops will review your condition with you and give her recommendations for treatment. This appointment should take approximately 30 minutes including an adjustment. After your initial two visits, your visit should only take about 15 minutes. Access your records by logging into the Patient Portal.